Are you looking for a truly unique experience in Tokyo? 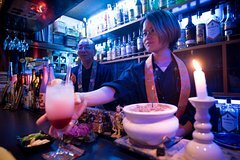 Join us and experience the long-standing Buddhist practice of shakyo at a "monk bar" in Nakano, the center of pop culture. Shakyo is a practice of hand-copying Buddhist sutras. It has long been part of religious training for Buddhist monks to purify their minds and accumulate merit, but now it's gaining a new-found appreciation among non-Buddhists as a way of meditation. Shakyo is often practiced at Buddhist temples or other formal settings, but in this 2-hour session, you can experience it at an intimate bar with the friendly guidance of a businessman-turned-priest. If you want a casual introduction to the deep and rich world of Buddhism, you should look no further than this! Make your way to Vows Bar on the second floor of World Kaikan Building, one of the oldest building in the area, located within 5 minutes' walk from Nakano Station on the JR Chuo-Sobu Line. Upon arrival, you will be greeted by the priest who opened this monk bar in 2004 after a turbulent career as a businessman fraught with numerous setbacks. Once settled, you'll learn about the long-standing tradition of shakyo from the priest and do some practice, then set about hand copying sutras. Take your time and put your heart into every stroke of the brush to find peace of mind. You don't have to worry even if you have no prior experience in calligraphy, as the priest will walk you through every step of the way. After the shakyo experience, engage in a fun conversation with the priest over a glass of sake or cocktail. As his life has been full of ups and downs, the priest has a lot of interesting stories to share as well as valuable life advice. The whole session ends at 7 pm, but If you wish to stay around for a bit longer and enjoy a few more drinks, feel free to do so at additional charge.